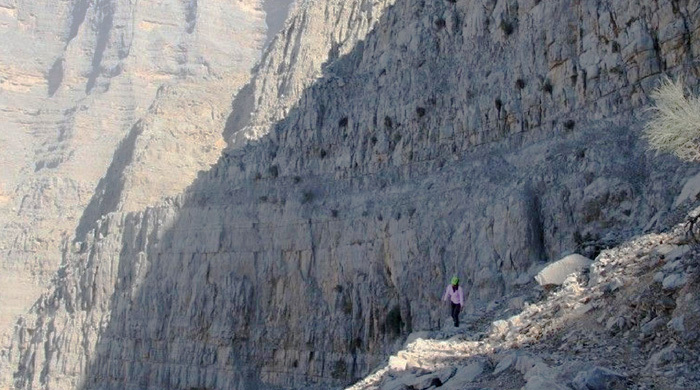 A route from the Wadi Ghalilah Dam almost straight up to Jebel Jais, with stunning views of Wadi Litibah, Wadi Ghalilah and Wadi Jais from the top, as well as all the main peaks of the Northern Emirates and Mussadam, except Jebel Harim. Very Rewarding, with challenging terrain being made easy with a well laid path, clear signage, steps, dry stone embankments and stone marked pathways, as well as stone bench’s/tables on route. The time taking on this gps file should be considered a slow time. A fast group should be able to do this in around 4 hours up and 2.5 down. Slower Groups (as in this example) is around 8 up and 3.5 down I have removed the top-to-bottom part from the gps file uploaded to keep it clean, however the waypoints naming will work both ways. There is currently a 15 minute walk down from the top point to the closest parking spot, if you do this route in reverse (top to bottom) and start there. * No warm up period – it’s steep from the start. Section 1: The route wastes no time in gaining elevation. It weaves its way along with water supply piping and electricity poles up the ridge and out of the wadi, at a sustained 1 in 4 gradient it zig-zags up over the barren ridge. The signs appear every hundred meters or so at this stage but soon spread out. This continues for 1/3rd of the route (up till the seating area after way point 10). Section 2: The path becomes a more shallow gradient for the next third of the route, although it never ceases to run out of upward opportunities, with a short sharp section early on with some impressive stone work zig-zagging the path up a tight gully mimicking the roads of San Fransico (Lombard Street). After this point, quick progress is made with beautiful views of farms to the left, some placed on the flatter sections, some placed more precariously on the seemingly inaccessible cliffs of LItibah. This section goes up until waypoint 15 at the Water Barrels under the tree anchored into the rock. Section 3: As you get to the end of section 2 a foreboding wall of cliffs, ledges and spiky summits lay ahead of you. This section defined the route for me making ease of difficult terrain. The gradient again increases to around 1 in 4 for this leg, with the path on this section being poorer quality than previously, and signage and markings disappearing all together. The route (looking at the face of the mountain) briefly heads up a gully right then switches straight left traversing on a narrow ledge with the only brief decent in the route. It then turns back to the right circling the peak up the rocky ledge before disappearing to the right hand side of the peak. A seating area sits half way through the section against the rock face; goats walk above here and rocks do fall. This section ends at waypoint 22, just a short traverse afterwards, where a water pumping station can be seen with a cement staircase heading sharply down from it. Section 4: A scree gully between waypoints 22 and 23 make up the shortest but more strenuous part of the route. The gully climbs around 35 degrees for around 800m (1/2 mile). The path for this leg is poorer quality often less clearly marked but don’t be concerned that you are off route due to this. As you top-out on the gulley a seating area makes for a well deserved rest at the top. Section 5: The last section makes up the last 1/6th of the route, and is the return to civilisation. Clear signage, and a solid clear path return after legs 3 and 4 felt more abandoned. Active Farms are to your left hand side; however take the path to the right and follow it around the edge of the hill at a more gradual gradient as in leg 2. This leads to the final short steeper section up to the ridge. At the ridge the submit sits to the right, and the path down to the Jebel Jais road (under construction) heads left for the final 100m.